Jean-Baptiste-Camille Corot (FR.Jean-Baptiste Camille Corot July 17, 1796, Paris — 22 February 1875, Paris) — prominent French painter, during his lifetime recognized by critics and audiences the "king of landscape." Features of works by Camille Corot: the desire to portray the mundane and modest nature without pomposity cabin, careful observation of changing States of nature. Colors, Corot used, often built on the finest gradations of the same color (a favorite phrase of the artist "Valery first of all"). The landscapes of Corot French painting pushed to turn away from "historical" narrative landscape, written according to academic rules the landscape more realistic, based on the direct live observation of nature. 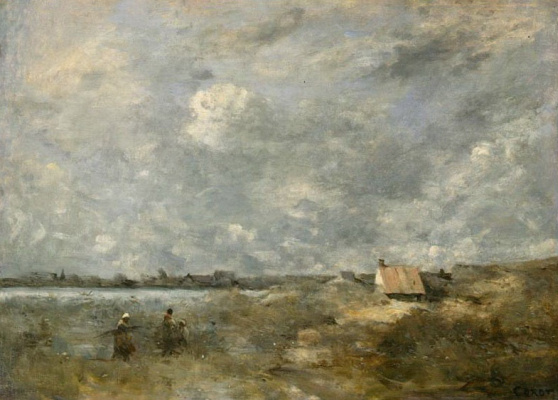 The artist considered the founder of the "landscape of mood" and a direct precursor of the Impressionists, whose work Corot, however, was not accepted. In the second half of his life, Corot also painted portraits, mostly female. Famous paintings of Camille Corot: "The bridge at Narni", "Orpheus leading Eurydice from the underworld", "Gust of wind", "Atelier of the artist","Lady in blue". Camille Corot has transformed the image of nature in high poetry. It was called the "king of landscape", the "poet of the trees" and "singer of the dawn". However, the first French President Napoleon III once joked about the morning landscapes by Corot: "To understand the paintings of this artist, you need too early to get up" and Ilya Repin, hostile to all French, called Camille Corot "boring". 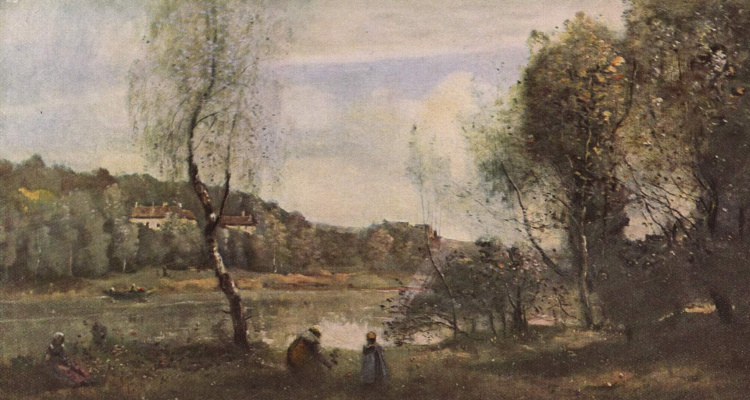 The landscapes of Corot, indeed, almost always serene. Quietly sleeping water, stretching into the distance horizons, sun-drenched city, sleepy hollow and dormant grove main themes of Corot. The official recognition he received quite late but the love of painting Corot, quickly crossed the borders of France. His work was admired by Charles Baudelaire and Theophile Gautier. Corot was an idol for Impressionists Camille Pissarroand Berthe Morisot. Isaac Levitan was so mad about the lyrical landscapes of Corot, even learned French to read the original biography of the beloved artist. And Erich Maria Remarque gave the paintings by Camille Corot of his beloved Marlene Dietrich. Biography of Camille Corot: "don't get along…"
The artist has lived quite an ordinary life without bright events and tumultuous passions, and why it is sometimes called "the man without a biography." He was born July 16, 1796 in Paris, in the family, far from the art. 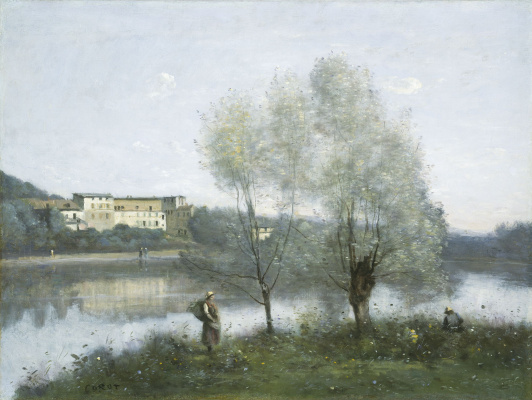 Mother Camille Corot, born Marie françoise Oberson, was the daughter of a Swiss winemaker, which inherited not only fortune, but also a commercial vein. She became a famous milliner and opened a hat salon, enjoyed great popularity. It was located on the banks of the Seine, opposite the Louvre. 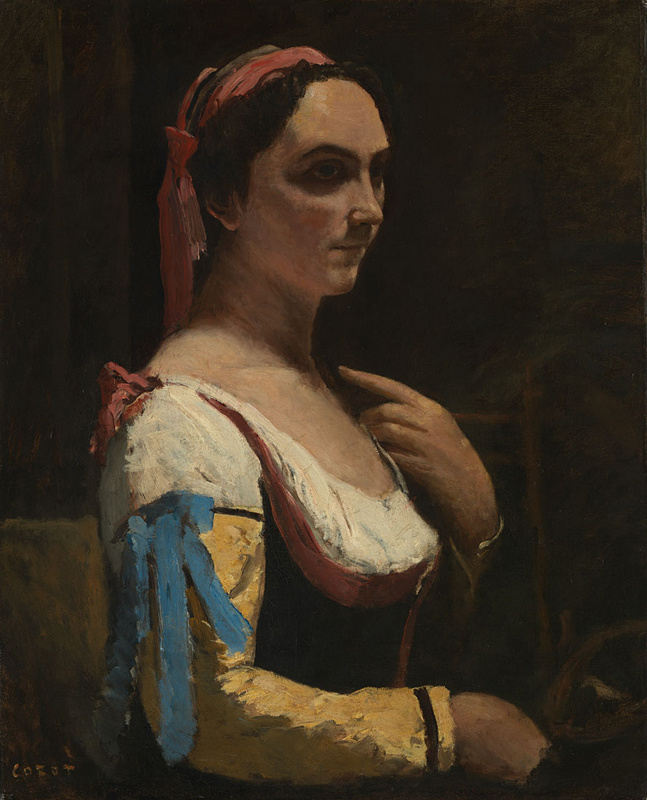 Then the son portray Madame Corot her lace cap with purple ribbons and dark blue dress with fashionable sleeves "Gigot" (from the French. gigot — leg of lamb) in the famous portrait of 1835. At this time Camille was already under 40, and he was still ridiculously addicted parents. And so will the rest of his life: Corot never create your own family, but the mother and father and older sister (the youngest will die when Camille is in her early 20s) will occupy in his life a huge place. Louis Jacques Corot, the artist’s father was from the hereditary landowners, but preferred to devote himself to the family business: in the Atelier of his wife, he was responsible for Finance. Things were going so smartly that the daughters Annette and Octavia Victoria Anna and son Camille had to send the education in the village. Shady corners and picturesque rural street — the first he could remember little of the Kingdom. And the first thing he drew. At the age of 11 for the academic success of Camille was transferred from the Paris orphanage Letellier into a privileged school in Rouen. But there he had yearned for her that my parents had to take him to study closer to home. After school, his father insisted that Camille became assistant to a cloth merchant Delapena, whose shop "the Baghdad Caliph" was located on the Rue Sainte-honoré in Paris. Camille passionately wanted to be an artist and not a seller of cloth, but could not dare to go against the will of his beloved parents. As much as 6 or 7 years in a row, on the same day of his father’s birthday, Corot came to him requesting permission to leave the trade for painting. But every time — to no avail. 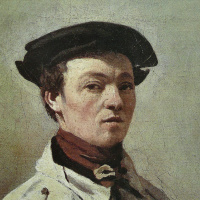 Corot was 26 years old when his father still accepted that merchant son not to be. "We don’t trade together allegedly, uttered the fateful evening Camille, — so I’m getting a divorce". Dad replied that in that case he will not be able to inherit their part of the family business, but allocated Corot annuity income that allowed me to not worry about food and to devote himself to art. The work of Camille Corot: "My only aim is to paint landscapes"
In 1822, Corot entered the Studio of the artist Achilles Michalon where exercise in the open air was paid not less attention than the work in the Studio. Six months later, Michallon died suddenly from pneumonia, and Koro goes to the disciples to Jean Victor Bertin. And Michalon, and Bertin was the academics. They taught the historic landscape. According to their science, Corot would never have become what I became. But he was lucky to go to Italy. There Corot has found his own style — more free and more realistic. Father Corot, though, and joked good-naturedly that the picture of the son will soon no longer fit in the Studio and have to pay extra to someone who will agree to buy, agree to Fund his trip. And from 1825 to 1828 Camille traveled all over Italy, but also Switzerland and France, filling countless sketches weighty albums. 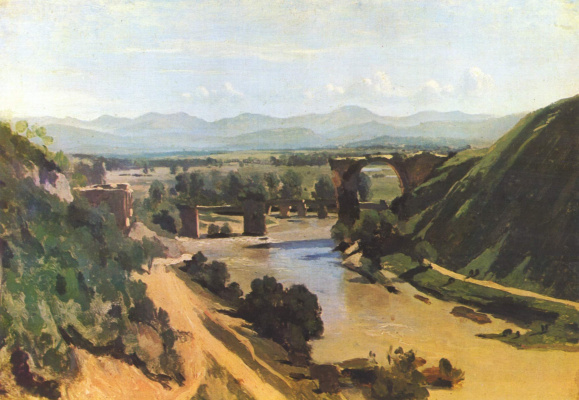 In 1827 from Italy Corot sends to participate in the French Salon several works, and among them — who later became famous landscape "The bridge at Narni". I wonder what this picture will start the perception of Corot as an avant-garde artist, advancing the time, but the Kingdom most in life is to crave just the opposite — not the glory of the avant-garde artist and the official recognition Salon. Corot will visit Italy and the second time in the third. He is going to travel a lot. The dense forests of Central France and the famous Swiss lake will become a constant source of his inspiration. At home his favorite places to work was a suburb of Paris, Ville d Evreux and the forest of Fontainebleau. Together with other artists Corot loved to come to Barbizon — village that gave its name to a school of painting. But his innovative romantic landscapes for a long time was not sold. "Donkeys! — scolded Corot public. — They bought paintings with the condition that those who write them, as far as possible defended by nature!" The work of Camille Corot: "Valera — first"
Those 6 or 7 years, when the Kingdom traded fabrics, its geography was limited to Paris. Now, in front of him opened the whole world. Thanks to his father (man's skeptical but generous) Corot could go to write nature where brighter or the dawn above the trees. There, where the terrain best accommodate his mental condition. This is an important principle of the creative approach Coro: the main thing in the landscape — to capture the mood, to catch the momentary movement to convey variability. And because drawings and sketches Corot is sometimes valued even higher than his finished paintings. Corot wrote not only the landscape is also remarkable for his portraits (for example, "Lady in blue"and "Interrupted reading"). But in them the most important thing — not the person, and mood. The second important principle Corot "Him first!" concerned painting technique. Valera is a variety of shades within one color, subtle gradations of tone that helps to convey the mood and fill the space with air and light. 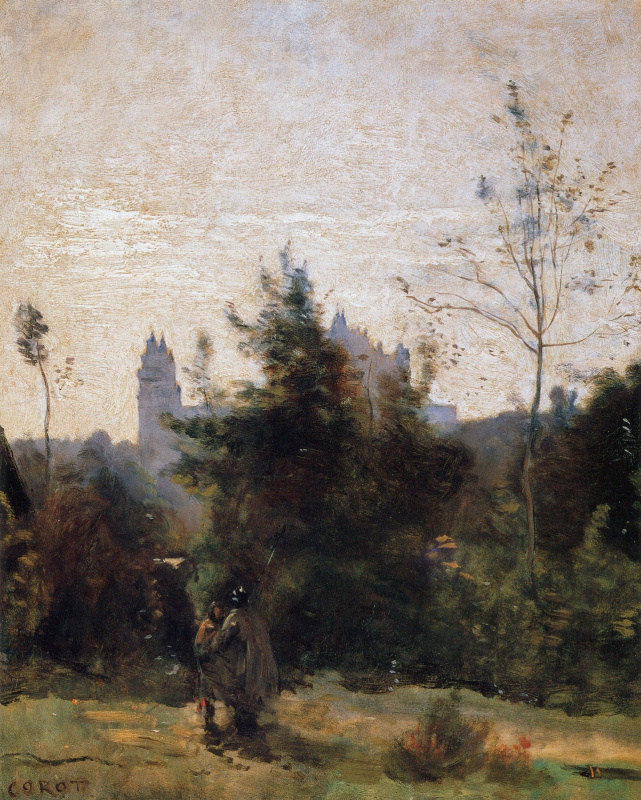 Work in the open air, the desire to convey the variability of nature, the play of light makes Corot the closest predecessor of the Impressionists. However it is a new direction treated cautiously, Morisot and Pissarro were discouraged to participate in the exhibitions of "the gang". Father long not believed in the talent of Corot. There is a legendary story about how he once saw in a magazine a beautiful lithograph and praised fulfill his acquaintance of the artist. And he wondered: "How? You don’t know what is a lithograph with a picture of your son’s Camille?" Corot belonged to her parents with trepidation. When they once again funded his trip, thanks to Camille sent them a self-portrait. In the self-portrait almost 40-year-old master painted himself clean-shaven — he was forced to shave his beard because it was required by fashion and the bourgeois decency of his parents. In the second half of life, soon overtook the recognition. His paintings became popular. They were ordered by the French government for the galleries and museums. Was chasing the collectors. Corot never received the Great medal of the Salon, but became a Chevalier of the Legion of honor. The number of orders exceeded the limit of human power, and Corot was forced to enlist the help of assistants, made copies of his works, which the artist only supplied his signature. That is why in museums and private collections hold many "counterfeit Kingdom" and it is a joke: "The artist has created 3 thousand paintings, of which 5 thousand are in the United States". 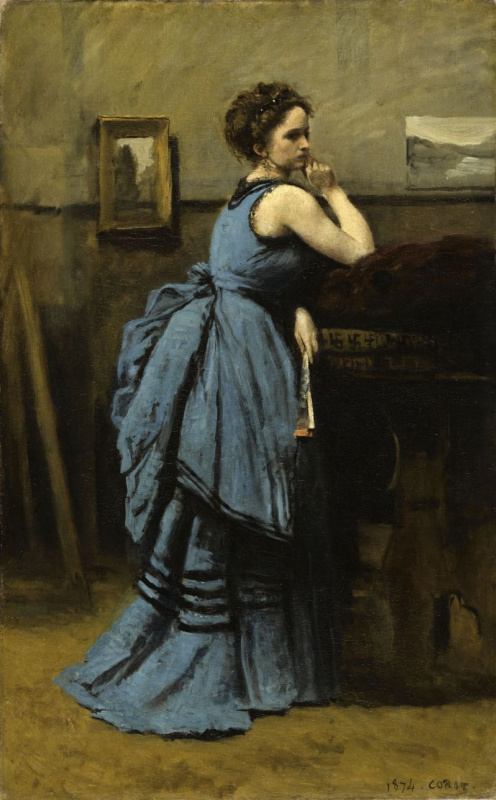 Corot’s father was no longer alive, and he was a middle-aged man and a world-renowned artist, but if he had to leave beyond the vicinity of Paris, Camille has always asked permission from the mother. Emotional dependence from his parents lasted until their deaths. Some believe that she could have prevented Corot to create my own family. But the artist thought otherwise: "I have only one goal, which I intend to follow all his life to paint landscapes. This decision is not final and does not allow me to tie the knot". 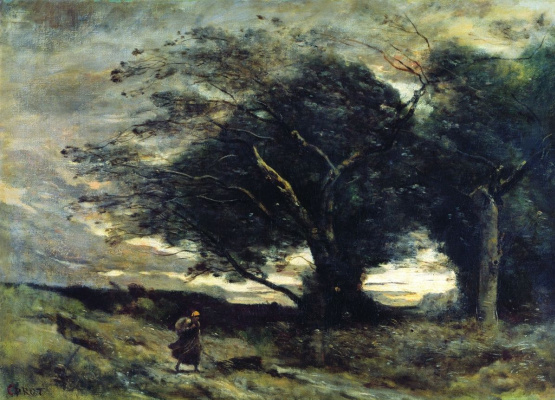 Corot died in February of 1875 from cancer of the stomach. But everyone knew: he was never able to recover from the death of his elder sister Annette Octavia, inherited from parents of the Paris fashion shop, and the former the closest person Camille. 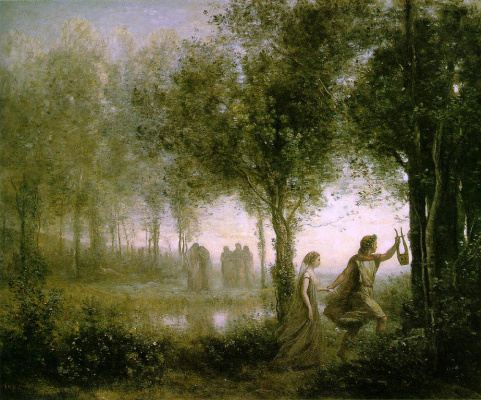 Shortly before his death he solemnly handed what Corot’s lifelong dream, — a gold medal of the Salon. Contemporaries Corot remembered only modest, kind and generous man. "Thank God, I have enough for a bowl of soup and a new candle" it was his credo most of my life until in old age, thanks to the inheritance his late fame, he became rich. Corot helped others: bought a house for the aged cartoonist Honoré Daumier that took care of the widow Francois Millet gave funds for nurseries device, could easily make generous dowry for his models. But the thing that gave us all this honest and humble "man without a biography", is a sublime and lyrical image of the world in his paintings. "Landscapes of Mr. Koro may not like what we see, wrote critic and journalist Maxim Doukhan, — but certainly, in terms of what I dream".